This Isn’t Going to Become a Gardening Blog, I Swear. Watering the plants yesterday, I learned a lesson about patience—a lesson my plants have been desperately trying to teach me for some time. They must be as frustrated with me by now as I have been with them. When I started taking care of them, they were all nearly dying of heat and drought prostration. I started watering them and feeding them and, at first, they got a bit worse. 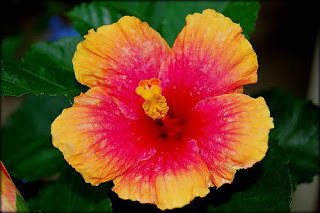 It showed especially in the hibiscus. The blooms they had all dropped off. I was extremely disturbed and couldn’t understand why the attention I was giving them wasn’t immediately paying off. I kept taking care of them though, because it did me good to get a little sun and a little peace outside and not lock myself in, being righteously productive with writing projects, (read: dinking around on the Internet and taking naps). It has been about six weeks or so since I started taking care of them. I went out yesterday to water and feed and noticed all the hibiscus that had initially dropped their blossoms were now thick with leaves and blooming like gangbangers with huge, bright flowers, more luscious than the previous ones had ever been. The top branches of the plants, once charred by the sun, had greened up and proudly reached for the sky. I smiled at myself and shook my head. Oh, yes… patience. Delayed gratification. Hard work paying off, surely, but SLOWLY. All those things we learn but discard in the now, now, now. I used to consider myself a black thumb when it came to plants, and now I realize maybe I just never hung around long enough to see the results of what I put into them. I used to consider myself a black thumb with some of my seedling writing projects. Maybe I just never hung around long enough to see the luscious blossoms come in.